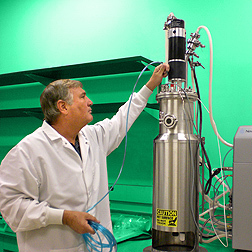 Plant pathologist Doug Boyette prepares a fermenter for growing fungus. Boyette and collaborators have found a fungus that may control Palmer amaranth, an aggressive weed that is developing resistance to some herbicides. Palmer amaranth is an aggressive southern weed that can grow at the rate of 2 inches a day and outcompete corn, cotton, soybean, and other crops for resources at the cost of their full yield potential. Now, based on recent greenhouse trials, it appears the fungus will also infect and kill or weaken Palmer amaranth, including weed biotypes that can resist glyphosate and other herbicides, such as triazines. According to Hoagland, a chemist in ARS’s Crop Production Systems Research Unit, Myrothecium attacks its weedy host’s leaf and stem tissues, causing wilt, necrotic lesions, loss of chlorophyll, and other disease symptoms that can kill young plants and weaken older ones, rendering them less competitive with crops. To test the infectivity of Myrothecium, the researchers used a filamentous growth stage of the fungus known as “mycelium” and sprayed a mycelial-surfactant formulation onto two batches of 4-week-old Palmer amaranth seedlings: those with glyphosate resistance and those without. They repeated the same procedure for 6-week-old plants. All groups were visually checked for symptoms over the experiment’s 7-day (168-hour) period and weighed for reductions in shoot growth. Seedlings were most susceptible, with all plants exposed to a full-strength application of the fungus showing disease symptoms. By 48 to 72 hours, nearly 100 percent had died. In 6-week-old plants, symptoms progressed more slowly, but there was no significant difference in injury between glyphosate-resistant and glyphosate-susceptible plants. Both groups showed disease symptoms, most notably chlorosis, some necrosis, and stunted growth. The findings, which were published in the March 2013 Allelopathy Journal, mark the first report of Myrothecium’s bioherbicidal activity against a weed species with glyphosate resistance. The research is a continuation of prior studies at Stoneville and elsewhere evaluating Myrothecium’s host specificity, environmental safety, ease of production, and optimal delivery. On a related front, the researchers are scrutinizing the genetic and biochemical mechanisms underpinning herbicide resistance in Palmer amaranth and other weeds. They have also begun studies on a strain of Xanthomonas bacteria found to infect the leaves of common cocklebur, marestail (or horseweed), and other herbicide-resistant threats to southern crops and potential targets for bioherbicide use.—By Jan Suszkiw, Agricultural Research Service Information Staff. This research is part of Crop Protection and Quarantine (#304) and Crop Production (#305), two ARS national programs described at www.nps.ars.usda.gov. Robert Hoagland is in the USDA-ARS Crop Production Systems Research Unit, 141 Experiment Station Rd., Stoneville, MS 38776-0350; (662) 686-5210. Douglas Boyette is in the USDA-ARS Biological Control of Pests Research Unit, National Biological Control Laboratory, 59 Lee Rd., Stoneville, MS 38776; (662) 686-5217. "Fungus Takes Down Another Weed" was published in the November/December 2013 issue of Agricultural Research magazine.